St. James Academy is seeking the school’s first ever playoff win as the Thunder travel to Lansing on Friday night. St. James Academy made the state playoffs for the only time in the schools’ history back in 2013 when the Thunder fell to Baldwin, 19-0. This season, the Thunder opened with six consecutive wins before a 45-14 loss to No. 1 Mill Valley. That district loss left St. James with a must-win game over Bonner Springs last week. The Thunder responded with an early 26-0 lead and held on for the 26-7 win. Dylan Streeter has stepped in at running back all season as starter Jake Burgmeier has dealt with a nagging injury. Streeter rushed for 242 yards and two touchdowns on 38 carries in the win over Bonner Springs. For the season, Streeter has 703 yards rushing and nine touchdowns. Burgmeier has been limited to 356 rushing yards and five touchdowns in just four games. Quarterback Trey Keith has amassed nearly 1,600 yards of total offense and 15 touchdowns. Keith has passed for 941 yards and nine score, while rushing for 656 yards and six touchdowns. Sophomore Mason Dunsmore is the Thunder’s leading receiver with 43 receptions for 587 yards and four touchdowns. St. James features a strong defense that has given up only 107 points all season (11.8 points per game), 45 of which came in the loss to top-ranked Mill Valley. Lansing has won three consecutive games since a 63-6 loss to Mill Valley in Week 6. The Lions other losses have come to Kaw Valley League rivals Bonner Springs (35-28) and Basehor-Linwood (28-6). The Lions feature a run-heavy offense that is led by junior Quinton McQuillan. McQuillan is a load at 6-foot-4 and 225 pounds and has rushed for 1,042 yards and 16 touchdowns on the season. Senior Zack Schneider has added 739 yards and seven scores on the ground for the Lions. Great Bend has quietly emerged as one of the state’s biggest surprises under second-year coach Tony Crough, in his first career stint as a head coach. The Panthers were 3-6 in 2014, but competitive in many contests. Great Bend has outscored teams, 293-242 this season. Last year, the Panthers tallied 173 points and allowed 221. Great Bend has played in many close games, including a 3-1 start in the first month that featured a 19-17 home victory against Leavenworth, a 40-29 road win versus rival Hays High, a 42-28 loss to Garden City, and a 23-12 victory against Wichita North. Leavenworth and Wichita North each made the playoffs. The Panthers finished 4-0 in the final month with a 52-51 victory at Newton, a 57-38 home victory versus Salina Central, and a 29-26 win against Salina South that clinched the district. Salina South won the play battle (67-50) and the yardage (384 to 299). However, Great Bend forced three turnovers. Great Bend averages 172 passing and 163 rushing a contest. Junior Jacob Murray has completed 100 of 179 passes for 1,546 yards with a 13/4 TD/INT ratio. He also has 183 carries for 743 yards and 17 scores, all team-highs. Great Bend is plus-4 in turnover margin, but has seven defensive scores and two safeties – among the state’s best. Great Bend is in the postseason for the first time since 2010 and hasn’t won a playoff game since 2007. Maize South, 2-5 all-time in the playoffs, has now made the playoffs in all six years of its existence. Senior quarterback Korie Frausto, a dynamic playmaker, has 1,460 rushing yards on the season. Maize South is 5-0 at home, 2-2 on the road. The Mavericks, like Great Bend, has played in several close games. Maize South opened the year with a 41-34 victory versus Goddard, defeated Holton 20-13, lost to Goddard-Eisenhower 29-20, and then defeated Andover Central, 51-41. Maize South fell at Bishop Carroll, 42-14, in district play. Maize South has a total scoring margin of 320-238. Friday will be the first ever meeting between the two programs. Maize South had its kicker hurt in the loss to Eisenhower. Maize South had a 301-244 edge in total yardage, but the game turned on an 87-interception return for Eisenhower. 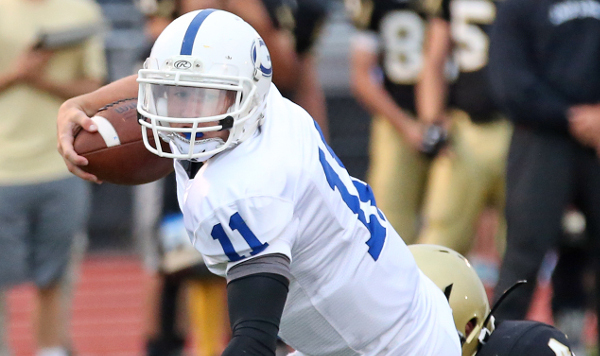 Maize South had five drives halted via turnover on downs inside the Eisenhower 20-yard line. Great Bend is going to have to continue its ability to make big plays on defense. The Panthers are going to give up some yards – they allow 322 per contest – and Maize South will rely heavily on Frausto. He leads the Mavs to victory.